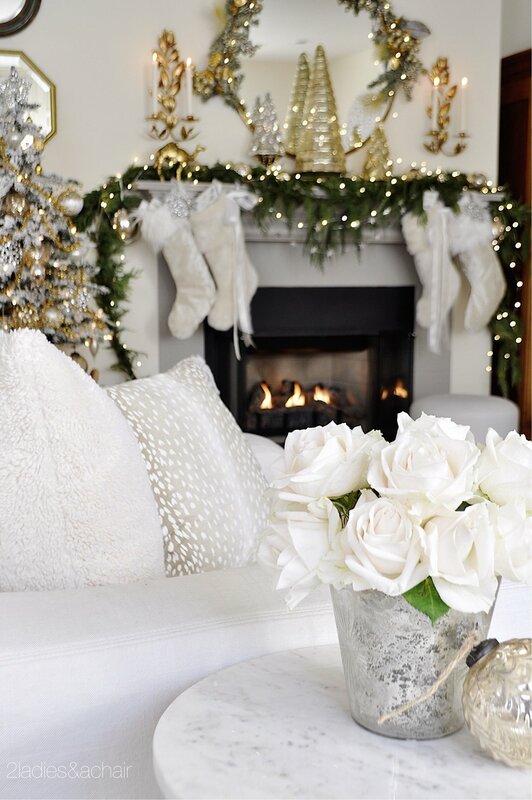 I’m so happy to welcome you to my Christmas Home Tour with rustic luxe style. Stay with me until the end of this blog and I’ll have links to fabulous bloggers sharing their beautiful Christmas decor. It’s my favorite time of year to gather my friends and family together for casual, cozy relaxing nights at home. I want my friends and family to feel welcomed and relaxed this holiday season, so I’ve decorated with a rustic luxe theme. Rustic luxe to me means comfy cozy with luxurious touches. Rustic evergreens, pine cones and woven baskets are combined for a comfy cozy atmosphere. The luxe elements are the luxurious touches of faux fur throws, satin ribbons, and mercury glass ornaments. In my entryway I’m showing off a craft project my daughter and I did for Christmas. My daughter saw these polar fleece trees at my friend Janine’s website at Happy Happy Nester and wanted to make them for our home. We enjoyed the afternoon crafting them! I think they turned out beautifully. My frosted Christmas tree in the living room features shimmering glass pine cones, silver ferns, twig orbs, and giant snowflakes. These elements give the tree a natural appeal. I kept my sofa simple with white furry pillows and a beautiful grey linen pillow embroidered with birch branches and tiny jingle bells. The chunky knit blanket is the perfect accent here! My family room is neutral for Christmas this year. Keeping it simple, I got rid of my bulky faux garland and bought fresh garland. I love how it drapes over the mantel. These big mercury glass trees I placed on the mantel have a vintage rustic feel to them. I started this Christmas season with a large faux Christmas tree next to the fireplace. The space felt too crowded and forced. I took it down and replaced it with this small frosted Christmas tree and love the result! Faux fur and velvet throw pillows are just the thing for long nights spent streaming Christmas movies. Trees seem to be a recurring theme in my Christmas decor this year. These were stray trees in my Christmas box that I grouped together. Now they’re a pretty collection of trees sparkling with twinkle lights. I moved the candle sconces here from my dining room. The candlelight adds a touch of romance. 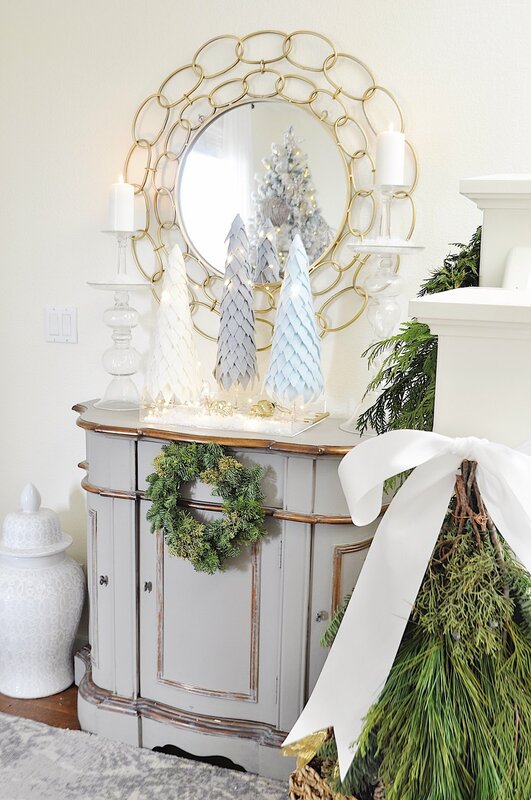 Here’s a look from my previous blog at the Christmas touches I made in my bedroom this year. This is what I’m looking forward to this holiday season, being with my family, gathered around the cozy fireplace! I really appreciate you stopping by to see my Christmas home tour with rustic luxe style. If you scroll to the end, you can subscribe to see what I’ll be decorating next! Don’t forget to check out the rest of these bloggers!